Since the time of the Ancient Greeks, much has been written about the relation between mathematics and music: from harmony and number theory, to musical patterns and group theory. Benson provides a wealth of information here to enable the teacher, the student, or the interested amateur to understand, at varying levels of technicality, the real interplay between these two ancient disciplines. The story is long as well as broad and involves physics, biology, psychoacoustics, the history of science, and digital technology as well as, of course, mathematics and music. Starting with the structure of the human ear and its relationship with Fourier analysis, the story proceeds via the mathematics of musical instruments to the ideas of consonance and dissonance, and then to scales and temperaments. 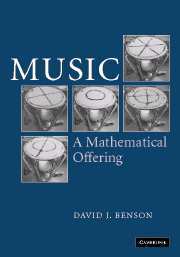 This is a must-have book if you want to know about the music of the spheres, digital music, and many things in between.